The National Diaper Bank Network, and its more than 280-member diaper banks, work to reduce diaper need, which impacts one in three U.S. families. Having the White House recognize that American families are struggling to provide even the most basic needs for their children is a huge step forward for the diaper bank movement. NEW HAVEN, CONNECTICUT, UNITED STATES, March 10, 2016 /EINPresswire.com/ -- Today, the White House announced a series of welcomed steps to increase access to diapers for low-income families experiencing diaper need, including the launch of a new Community Diaper Program, as well as an increase in donations of free diapers to the National Diaper Bank Network (NDBN). The Community Diaper Program, developed by the online commerce site Jet.com, will provide nonprofit organizations that serve families in need with the opportunity to purchase high-quality diapers for infants and toddlers at significantly reduced prices. Huggies will donate an additional two million free diapers to NDBN, upping its planned donation in 2016 from 20 million to 22 million diapers. Plus, for every diaper donated through the Huggies Rewards program, from now through April 10, Huggies will match those donations up to 1 million additional diapers to NDBN. The Community Diaper Program will enable qualified nonprofit organizations to purchase low-priced diapers beginning in late April 2016. The application process will be expedited for NDBN members that maintain independent 501(c)(3) status. NDBN members interested in the program can begin the application process by logging on to Jet.com/JetCares. "Having the White House recognize that American families are struggling to provide even the most basic needs for their children is a huge step forward for the diaper bank movement," said NDBN Executive Director Joanne Goldblum. "Our solution to addressing diaper need is simple. Help families when and where you can by providing basic needs, like diapers. We believe small things impact big things." As the foremost authority on diaper need in America, NDBN was invited by The New Haven Mental Health Outreach for MotherS (MOMS) Partnership at the Yale School of Medicine to help provide insight to Jet and to the White House as to the prevalence of the issue and the growing diaper bank movement. NDBN also explained how community-based diaper banks and diaper pantries help improve the well-being of families in need by collecting, warehousing, and distributing donated and purchased diapers. NDBN’s membership includes more than 280 community-based diaper banks and diaper pantries located throughout the U.S.
Kimberly-Clark first brought the issue of diaper need to the forefront in 2010, when the groundbreaking Huggies Every Little Bottom study revealed one in three U.S. moms suffer from the inability to provide fresh, clean diapers for their babies. 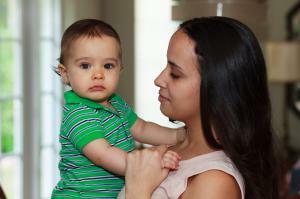 * These parents often have to choose between paying for food or diapers which can lead to increased stress and strife. Following the study, Huggies took action and became the founding sponsor of the NDBN, and has since donated more than 160 million diapers to babies in need. In conjunction with the Community Diaper Program, Jet.com is rallying support among its customers to make financial contributions to NDBN's Funds for Change grant program for diaper banks and diaper pantries. The National Diaper Bank Network (NDBN) is a nationwide nonprofit founded in 2011. NDBN is dedicated to eliminating diaper need in America and leads a grassroots movement to help meet the basic needs of all babies and their families…including access to clean, dry diapers and other material goods. The Network raises awareness of diaper need (#DiaperNeed) and supports the development and expansion of diaper banks in communities throughout the country. Its active membership includes more than 280 diaper banks, diaper pantries, and food banks located in 45 states, Guam and the District of Columbia. Huggies® Every Little Bottom is the founding sponsor of NDBN. Huggies donates more than 20 million diapers to NDBN each year to help families in need. More information on NDBN and diaper need is available at www.nationaldiaperbanknetwork.org, and on Facebook (facebook.com/NationalDiaperBankNetwork) and Twitter (@DiaperNetwork).